BBC News – The disappearing art of making scissors by hand. Have a look at the fascinating short video about scissor making in the link above if you get chance. Ernest Wright & Son (Kutrite) have been hand-making scissors and shears in Sheffield, England since 1902. 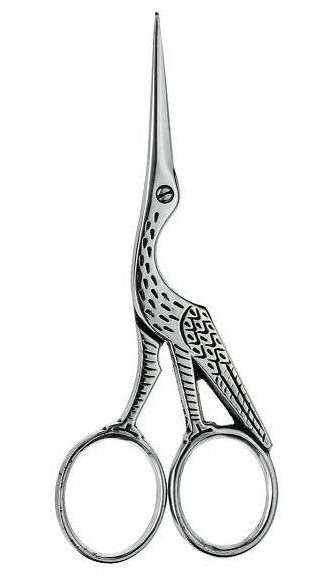 Their scissors and shears come with a life-time guarantee. They produce scissors for art and craft, gift, ceremonial and gold plated scissors, dressmaking, tailor and clothwork scissors, embroidery and fine craft scissors, garden and floral art scissors, kitchen scissors, nail and personal care scissors, office, general and left-handed scissors, and professional and trade scissors. Ernest Wright and Son went bankrupt towards the end of 2018 and since then a pair of Dutch entrepreneurs bought the company and have re-launched it in the hope of keeping it going, albeit with the prices considerably inflated. UK scissor manufacturers include Samuel Staniforth, Taylor’s Eye Witness, A.Wright and Son, J.Adams, Ernest Wright and Son, William Whiteley, and Slater Knives. Ernest Wright and Son ‘Stork’ embroidery, needlework and thread scissors. Made in England. This entry was posted in Cutlery, Scissors, Sheffield Steel and tagged art and craft, British made scissors, craft scissors, Ernest Wright, Ernest Wright and Son Limited, kitchen scissors, Made in England, Scissors, Sheffield scissors, Sheffield Steel, UK made scissors on August 1, 2014 by ukmade.